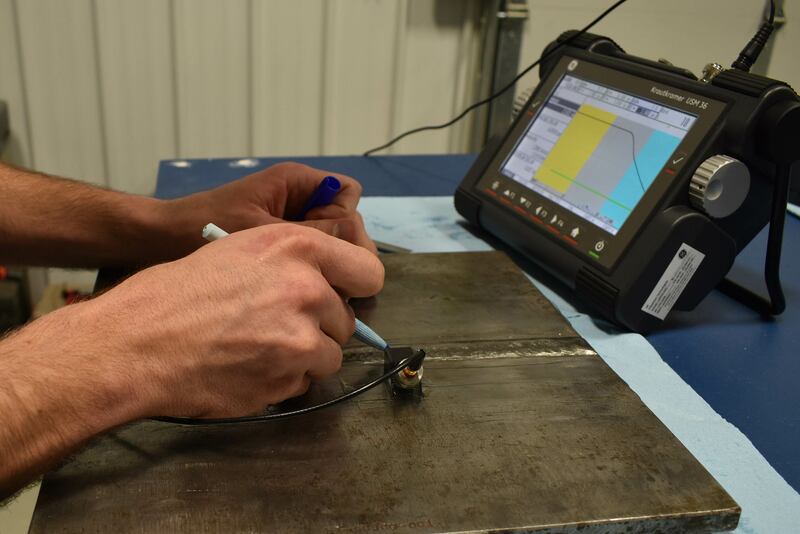 Ultrasonic NDT Testing | Shear Wave testing, also known as an angle beam inspection, is an ultrasonic testing technique that is great for weld inspections. A probe consisting of an ultrasonic transducer with a plastic or lucite wedge introduces an ultrasonic beam at an angle into the test area. As the probe is moved back and forth along the tested area, it can detect discontinuities in the weld based on the refraction of the ultrasonic beam. Shear Wave UT is an established method, very common, and very effective for weld inspections. Testing can be performed with little or no disruption of nearby personnel that would have otherwise been caused if the same job was competed using X-Ray (RT) due to radiation hazards. Equipment for testing is not cumbersome, it is readily available, thus making cost of inspection method less than other advanced ultrasonic testing methods. Shear Wave is very technician skill dependent. Less probability of detection when compared to PAUT due to less beam angles being transmitted. Accuracy of sizing flaws dependent on operator and operator’s training/experience.